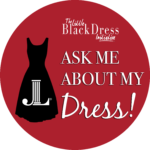 The Little Black Dress Initiative (LBDI) is a global initiative started by the Junior League of London to raise awareness of the impact of generational poverty. Advocates wear one black dress (or outfit) for five consecutive days to illustrate the effects poverty can have on our society. Each Advocate wears along with her dress a pin that reads “Ask Me About My Dress”, which invites dialogue among colleagues, friends and strangers about this important initiative.